Fly Repellent: Bite Free, Endure, Flysect, Tri Tec 14, Ultrashield, Espree, Pyranha! • Bite Free Biting Fly Repellent: Advanced formula repels biting stable flies, horn flies, horse flies, deer flies, gnats and mosquitoes and other nuisance flies. Works for 5 to 7 days. Also repels and kills deer ticks that may transmit Lyme disease. Ready-to-use, water-based formula is gentle on sensitive-skinned horses. Contains sunscreen for protection against harmful UV rays. Spray or wipe on with trigger sprayer. 32 oz. #12712. ORDER NOW! Active Ingredients: Cypermethrin, CAS #52315-07-8 0.15%, Pyrethrins, CAS #8003-34-7 0.20%, Piperonyl Butoxide, Technical, CAS #51-03-6 1.60%, Butoxypolypropylene Glycol, CAS #9003-13-8 5.00%. Other Ingredients: 93.05%..
• Equisect Fly Repellent: A Natural Fly Spray That Really Works! Tested and proven effective against 5 types of flies, mosquitoes, lice and gnats on horses, and fleas and ticks on dogs and cats. Contains the botanical repellent PyGanic®, the first pyrethrum listed by the Organic Materials Review Institute for use in organic farming. Also contains botanical and essental oils of citronella, clove stem, thyme and corn mint. 32 oz. Trigger sprayer. ORDER NOW! Ingredients: Pyrethrins, Deionized Water, Ethoxylated Caster Oil, Oil Of Citronella, Corn Mint Oil, Thyme Oil, Clove Stem Oil. • Bronco Equine Fly Spray Plus Citronella: Water-based, ready-to-use pyrethrin and permethrin formula is economical, yet effective. Repels and kills house flies, horn flies, stable flies, deer flies and horse flies, also mosquitoes, lice and gnats. Micro-emulsified for better penetration of hair coat. Pleasant citronella scent. Comes with trigger sprayer. 32 oz. #14810. ORDER NOW! Ingredients: Prallethrin, Permethrin, Piperonyl Butoxide, Methyl, Cyclopent, Trans Chrysanthemate, Carboxylate. • Bronco Gold Equine Fly Spray: Especially developed for use on horses. Provides a protective hair coating against flies while imparting a high sheen to the hair when brushed out. Repels and kills stable flies, horn flies, house flies, face flies, horse flies, deer flies, mosquitoes and gnats. Also acts as a grooming aid and coat conditioner. Contains Pyrethrins, Piperonyl Butoxide Technical and Butoxypolypropylene Glycol. 32 oz with trigger sprayer. ORDER TODAY! Ingredients: Pyrethins, Piperonyl Butoxide Technical, Butoxypolypropylene Glycol. FLY/PEST CONTROL: Bite Free, 32 oz. FLY/PEST CONTROL: Equisect Fly Repellent, 32 oz. FLY/PEST CONTROL: Bronco® Equine Fly Spray Citronella, 32 oz. FLY/PEST CONTROL: Bronco® Gold Equine Fly Spray, 32 oz. • Endure Sweat Resistant Fly Spray: Stays on and keeps working, even in wet conditions. Provides up to 14 days fly control. Contains special conditioner that binds to hair shaft - won't sweat off. Protects against biting and nuisance flies, gnats, mosquitoes, deer ticks and lice. Repels and kills deer ticks that may transmit Lyme Disease Includes sunscreen. The only fly spray with RepeLock® RepeLock is an exclusive conditioner that binds to the hair shaft, locking in Endure's fly repellency. This unique formula stays active even when your horse sweats or in wet conditions. 32 oz. with trigger sprayer. #3002431. ORDER TODAY! Ingredients: Cypermethrin 0.15%, Pyrethrins 0.20%, Piperonyl Butoxide 1.60%, Butoxypolypropylene Glycol 5.00%. • Endure Roll-On for Horses: Protects from House Flies, Face Flies, Horn Flies, Stable Flies, Black Flies and Biting Gnats. Works up to 5-7 days. Includes sunscreen and coat conditioners. Convenient, ready-to-use. Easy-grip bottle features a large ball for easy, even application. 3 oz. ORDER TODAY! Ingredients: Cypermethrin, Pyrethrins, Piperonyl Butoxide Technical, Di-n-propyl isocinchomeronate, Butoxy Polypropylene Glycol. • Flysect Citronella Spray: Botanically-derived pyrethrins and oil of citronella in a gentle, yet highly-effective spray. Controls flies, gnats and mosquitoes. Also contains lanolin to condition coat and skin. Repels & kills mosquitoes that may transmit viral infections like West Nile. 32 oz. ready-to-use with trigger sprayer. #11301. ORDER TODAY! Ingredients: Permethrin, Pyrethrins, Piperonyl Butoxide, N-Octyl bicycloheptene dicarboximide, Di-n-propyl isocinchomeronate, Butoxypolypropylene Glycol. FLY/PEST CONTROL: Endure Sweat Resistant Fly Spray, 32 oz. FLY/PEST CONTROL: Endure® Roll-On for Horses, 3 oz. FLY/PEST CONTROL: Flysect® Citronella Spray, 32 oz. • Flysect Super-C Concentrated: Economical concentrated fly protection. Contains 2 repellents, plus pyrethrins and permethrin. Aloe and lanolin condition the coat. PABA sunscreen provides protection from harmful UV exposure. 32 oz. ORDER NOW! Active Ingredients: Permethrin [(3-Phenoxyphenyl) Methyl (±) cis/trans- 3-(2,2-dichloroethenyl)-2,2-dimethylcyclopropane carboxylate]: 1.00%, Pyrethrins: 0.50%, Piperonyl Butoxide, Technical: 1.85%, N-octyl Bicycloheptene Dicarboximide: 3.10%, Di-n- Propyl isocinchomeronate:2.50%. Inert Ingredients: 91.05% . • Flys-Off Insect Repellent: Flys-Off Insect Repellent for Dogs & Cats protects pets from flies, gnats, mosquitoes, fleas, ticks and lice. Flys-Off Insect Repellent helps maintain your pet's skin healthier by reducing itchiness, irritation, and the need to scratch. Flys-Off Insect Repellent comes in an easy to use pump spray bottle and can also be used as a surface repellent on bedding. Convenient pump spray. 6 oz. Pump Spray. ORDER TODAY! Ingredients: Pyrethrins: 0.15%, Piperonyl butoxide: 1.50%, N-Octyl Bicycloheptene Dicarboximide: 0.50%, Di-n-propyl Isocinchomeronate: 0.50%, Other Ingredients: 97.35%. Active Ingredients: Diflubenzuron 0.24% (Dimilin). Inactive Ingredients: Wheat Middlings, Dehydrated Alfalfa Meal, Calcium Carbonate, Sodium Chloride, Calcium Propionate (preservative). SimpliFly Feed-Thru Fly Control 3.75 lbs. FLY/PEST CONTROL: Flysect Super-C Concentrated, 32 oz. FLY/PEST CONTROL: Flys-Off Insect Repellent 6 oz. 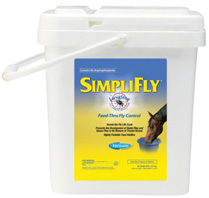 FLY/PEST CONTROL: SimpliFly Feed-Thru Fly Control 3.75 lbs. • Repel-X Ready To Use: Repel-Xp in a ready-to-use formula. Water-based and contains botanically-derived pyrethrins and permethrin. Effective against six fly species, mosquitoes, gnats, fleas and ticks. 32 oz. with trigger sprayer. #10330. ORDER TODAY! Ingredients: Pyrethrins, Piperonyl Butoxide, Permethrin. • Tri-Tec 14 Spray: Combines botanically-derived pyrethrins with cypermethrin to form a fast-acting, long-lasting fly control formula that repels and kills flies and other insects for up to 10-14 days. Contains a sunscreen which protects against both forms of the sun's harmful, ultra violet rays Water-based formula won't irritate even sensitive-skinned horses. Protects horses against horse, house, stable, face, horn and deer flies as well as gnats, mosquitoes, lice and deer ticks. 32 oz. with trigger sprayer. #46512. ORDER TODAY! Ingredients: Cypermethrin, Pyrethrins, Piperonyl Butoxide Technical, Butoxy Polypropylene Glycol. • Ambush Insecticide & Repellent: For use on horses and dogs. Kills and repels stable flies, horse flies, face flies, deer flies, house flies, horn flies, mosquitoes, gnats, ticks, fleas, chiggers and lice. Also controls fleas and ticks on dogs. Non-oily, insecticide repellent. Contains Pyrethrins, Piperonyl Butoxide Technical and Permethrin. 32 oz. trigger sprayer. ORDER TODAY! Ingredients: Pyrethrin, Permethrin, PiperonylButoxide, & Citronella Scent. Nature’s Defense Fly Repellent: Nature’s Defense Fly Repellent Spray is a water-based blend of Citronella and essential oils. Nature’s Defense Fly Repellent Spray is gentle, non-greasy, non-oily spray or wipe-on for horses, ponies and foals. The alcohol-free formula will not burn horses’ sensitive skin and is gentle enough to use daily. Nature’s Defense Fly Repellent Spray helps deter Horn flies, stable flies, House flies, Horse flies, Deer flies, Mosquitoes and Gnats. Fresh herbal fragrance. • Nature’s Defense Fly Repellent Ready-to-Use Spray: 32 oz. ORDER TODAY! • Nature’s Defense Fly Repellent Concentrate: 32 oz. ORDER TODAY! Ingredients: Citronella Oil, Clove Oil, Mint Oil, Thyme Oil, Sodium Lauryl Sulfate, Glycerine, Water. FLY/PEST CONTROL: Repel-X Ready To Use, 32 oz. FLY/PEST CONTROL: Tri-Tec 14 Spray, 32 oz. FLY/PEST CONTROL: Nature’s Defense Fly Repellent RTU Spray 32 oz. FLY/PEST CONTROL: Nature’s Defense Fly Repellent Concentrate 32 oz. Repel-X Pe: The horseman's choice for more than 30 years. Diluted 1:7 with water, Repel-Xp provides economical protection from house flies, horn flies, gnats and mosquitoes. Mixed at 1:4 dilution, kills ticks, horse flies, deer flies and stable flies Single application keeps flies, gnats, ticks and mosquitoes off horse for days. Superior fly control that's easy on the budget. ORDER TODAY! • Repel-X Pe: 32 oz. #10321. • Repel-X Pe: 16 oz. #10320. • Repel-X Lotion: The reliability of Repel-X in a smooth, spreadable lotion. Excellent for spot treatment around eyes, muzzle, ears and wounds. Cypermethrin formula with botanically-derived pyrethrins to repel and kill biting flies, filth flies, biting gnats, ticks and lice. One application works 5 to 7 days. Includes sunscreen and conditioners for healthy skin and coat. Non-greasy formula won't collect dust or dirt. Easy to apply with a convenient flip-top bottle for one-handed application. 8 oz. flip-top bottle. ORDER TODAY! Active Ingredients: Cypermethrin [(±)-a-cyano-(3-Phenoxyphenyl) Methyl (±)cis, trans 3-(2,2-Dichloroethenyl)-2,2- Dimethylcyclopropanecarboxylate]: 0.15%, Pyrethrins: 0.20%, Piperonyl Butoxide Technical: 1.63%, Di-n-propyl isocinchomeronate: 0.50%, Butoxy Polypropylene Glycol: 4.85%. Inert Ingredients: 92.67%. • Mosquito Halt Repellent Spray for Horses: Repels Before Mosquitoes Bite. Quick knockdown, kill and repellency for control of mosquitoes. Also controls gnats, face flies, stable flies and house flies. For use on horses, ponies and foals. 32 oz with trigger sprayer. (Voted Horse Journal Product of the Year 2010). ORDER TODAY! Ingredients: Permethrin, Prallethrin, Piperonyl Butoxide, Technical, Butoxypolypropylene Glycol, Di-N-Propyl Isocinchomeronate, N-Octyl Bicycloheptene Dicarboximide. FLY/PEST CONTROL: Repel-X Pe, 32 oz. 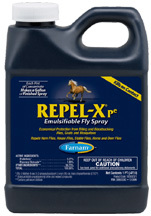 FLY/PEST CONTROL: Repel-X Pe, 16 oz. FLY/PEST CONTROL: Repel-X Lotion, 8 oz. FLY/PEST CONTROL: Mosquito Halt Repellent Spray, 32 oz. Wipe® Original Formula Fly Protectant: Powerful formula repels horse flies, house flies, stable flies, deer flies, gnats and mosquitoes for a full 24 hours and kills them on contact. Easy to apply with an applicator or piece of Turkish toweling. Helps in the removal of dirt and dandruff and adds shine to the coat. Effective, economical fly control. ORDER TODAY! • Wipe Original Formula Fly Protectant: 32 oz. #10123. 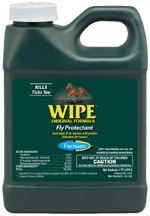 • Wipe Original Formula Fly Protectant: 16 oz. #10122. • Wipe II Citronella Spray: Botanically-derived pyrethrin formula that contains 1% citronella and coat-conditioning lanolin. Repels and kills stable, horse, face, deer, house and horn flies, plus mosquitoes and gnats. Pleasant smelling. 32 oz. with trigger sprayer. #10140. ORDER TODAY! FLY/PEST CONTROL: Wipe Original Formula Fly Protectant, 32 oz. FLY/PEST CONTROL: Wipe® Original Formula Fly Protectant, 16 oz. FLY/PEST CONTROL: Wipe® II Citronella Spray, 32 oz. Swat Fly Repellent Ointment: Protects wounds, open sores, scratches and abrasions from dirt, filth and disease-carrying flies. Botanically-derived pyrethrin formula repels house flies, stable flies, face flies and horn flies, and kills them on contact. Ideal for use on the ears and other facial areas. Apply daily for continued protection. For use on horses, ponies and dogs. Original Pink #S8294 or Clear #S8293. 6 oz. jar. ORDER TODAY! • Swat Fly Repellent Ointment Pink: 6 oz. jar. #12301. • Swat Fly Repellent Ointment Clear: 6 oz. jar. #12302. Ingredients: Piperonyl Butoxide, Butylcarbityl, 6-Propylpiperonyl, Ether And Related Compounds, Pyrethrins, Di-N-Propyl Isocinchomeronate, Petroleum Distillates. • Roll-On Fly Repellent: Repels and kills house flies, stable flies, face flies and horn flies from sensitive areas of the face and head of horses and ponies. Apply around animal's nose, eyes, ears, mouth and also around wounds and other surface lesions. Works hours at a time. Botanically-derived pyrethrin formula keeps flies off - kills them on contact. Never dries out so it lasts and lasts. Easy-to-grip plastic roll-on bottle. 2 oz. ORDER TODAY! Ingredients: Active Ingredients: Pyrethrins 0.40%, Piperonyl Butoxide Technical 1.00%, Di-n-propyl isocinchomeronate 1.00%, N-octyl bicycloheptene dicarboximide 0.40%. Other Ingredients: 97.20%. • Equi-Spot Spot-on Fly Control: Sweat resistant fly & tick control that works rain or shine. Ideal for pastured horses. Convenient to use. More fluid per application for more complete coverage. Sweat resistant formula. Kills & repels house flies, stable flies, face flies, horn flies, eye gnats, and ticks on horses. Aids in the control of horse flies, deer flies, mosquitoes and black flies on horses. Citronella scent. 3 x 0.34 oz. (10.0 mL) applicators. ORDER NOW! • Equi-Spot Fly Control Stable 10cc. : Equi-Spot Fly Control Stable is the #1 selling spot on for horses! Protects horses from flies, gnats, mosquitoes and ticks. Kills and repels house flies, stable flies, face flies, horn flies, eye gnats and ticks on horses. Equi-Spot Fly Control Stable helps in the control of horse flies, deer flies, mosquitoes and black flies on horses. Use only on horses more than 12 weeks (3 months) of age. Package includes six 0.34 oz. applicators -- a 12 week supply. ORDER NOW! Ingredients: Permethrin (CAS #52645-53-1) 45%. Other ingredients 55%. CAUTION: FOR EXTERNAL USE ON HORSES ONLY. Do not use on foals under 12 weeks of age. Consult a veterinarian before using this product on debilitated, aged, medicated, pregnant, or nursing horses. Consult a veterinarian before using on horses with known organ dysfunction. DO NOT USE ON CATS or animals other than horses. Certain medications can interact with pesticides. It is advisable to consult a veterinarian before using this product with any other pesticide or drug. 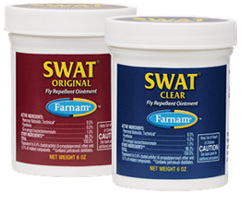 FLY/PEST CONTROL: Swat Fly Repellent Ointment, 6 oz. FLY/PEST CONTROL: Roll-On Fly Repellent, 2 oz. FLY/PEST CONTROL: Equi-Spot® Spot-on Fly Control, 3/0.34 oz. • UltraShield EX Insecticide & Repellent: UltraShield EX is the first weatherproof, sweat resistant, 17 day formula in fly control. It's the hardest working insecticide-repellent around - it can even be used on dogs. Be sure to stock up! Hardest working insecticide-repellent around. Sweat resistant formula. Quick knock-down, kills and repels, Weatherproof. 32 oz. Sprayer. ORDER NOW! Active Ingredients: Permethrin 0.50%, Pyrethrins 0.10%, Piperonyl Butoxide 1.00%. Other Ingredients: 98.40%. • UltraShield Natural Fly Repellent Green Ready To Use: UltraShield Green Natural Fly Repellent Ready To Use is made with Geraniol and six fly-fighting natural oils, for use horses on ponies, foals, and dogs. UltraShield Green Natural Fly Repellent helps repel and controls biting flies, mosquitoes, and gnats for up to 8-hours. Leaves coats shiny. Natural UltraShield Green Natural Fly Repellent features an eco-safe formula that’s safe for the entire family and the environment. Features a fresh botanical fragrance. 32 oz. Trigger Spray Bottle. ORDER NOW! Active Ingredients: Thyme Oil 0.01%, Cedar Oil 0.05%, Lemongrass Oil 0.05%, Rosemary Oil 0.05%, Citronella Oil 0.06%, Clove Oil 0.08%, Geraniol 0.70%, Sodium Lauryl Sulfate 2.50%. Inert Ingredients: 96.50%. • UltraShield EX Insecticide & Repellent Carpet & Surface Spray For Dogs: UltraShield EX Insecticide & Repellent Carpet & Surface Spray For Dogs helps kill and repel fleas, ticks, and lice. Fast knockdown, kill, and repellency remains effective for up to 14 days. For use on carpets and bedding. 16 oz. Trigger Spray Bottle. ORDER NOW! • UltraShield Natural Fly Repellent Green Pet: UltraShield Green Natural Fly Repellent is made with Geraniol and six fly-fighting natural oils, for use on horses, ponies, foals, and dogs. UltraShield Green Natural Fly Repellent helps repel and control biting flies, mosquitoes, gnats, and ticks. Leaves coats shiny and features a fresh botanical scent. 32 oz. Trigger Spray Bottle. ORDER NOW! Active Ingredients: Thyme Oil 0.01%, Cedar Oil 0.05% Lemongrass Oil 0.05%, Rosemary Oil 0.05%, Citronella Oil 0.06%, Clove Oil 0.08%, Geroniol 0.70%, Sodium Laureth Sulfate 2.50%. Inert Ingredients: 96.50%. FLY/PEST CONTROL: UltraShield EX Insecticide & Repellent 32 oz. FLY/PEST CONTROL: UltraShield Natural Fly Repellent Green Ready To Use 32 oz. FLY/PEST CONTROL: UltraShield EX Insecticide & Repellent Carpet & Surface Spray For Dogs 32 oz. UltraShield Natural Fly Repellent Green Pet 32 oz. • FLYS X Medicated Multi-Species Spray: Flys-X Medicated Multi-Species Spray helps kill germs on contact to help treat fungal and bacterial conditions such as ringworm, rain rot, dermatitis, foot rot and other skin and hoof infections. Helps stops itch and guards against infection. Flys-X Medicated Multi-Species Spray for use on Show Cattle, Show Pigs, Show Goats, Show Poultry, Horses, Foals, Sheep, Donkeys, Llamas and Dogs. Will not burn or sting. Not for use on animals intended for food or milk. 16 oz. sprayer. #430295. ORDER NOW! Active Ingredient: Chloroxylenol 0.5%. Other Ingredients: DMDM Hydantoin, Eucalyptus Oil, Glycerin, Polysorbate 20, Propylene Glycol, Purified Water. • FLYS X Livestock Ready To Use Insecticide: Water-based Flys-X is a livestock fly spray perfect for the multi-species fly control needs of hobby farmers. Flys-X contains Pyrethrins, a botanical insecticide. Flys-X is for use on horses, foals, cattle, pigs, goats, sheep, donkeys, llamas, poultry, and dogs. Flys-X helps kill horn flies, houseflies, face flies, mosquitoes, gnats, and blood-sucking lice. Kills fleas and brown dog ticks on dogs and on premises. 32 oz. Trigger Spray Bottle. ORDER NOW! Active Ingredients: Pyrethrins 0.1%, Piperonyl Butoxide 1.0%. Other Ingredients: 98.9%. FLY/PEST CONTROL: FLYS X Medicated Multi-Species Spray 16 oz. FLY/PEST CONTROL: FLYS X Livestock Ready To Use Insecticide 32 oz. • REVENGE Equine Fly Spray: REVENGE Equine Fly Spray is a Ready to Use Insecticide & Repellent. Weatherproof formula binds to the hair shaft to repel and protect from listed insects, sweat, rain, dust and dirt. Rapid knockdown, kill and repellency is effective long-term control for up to 14 days. Use as a spray, wipe on, or roll on to kill and repel over 70 species of listed flying and crawling insects, on pastured horses, ponies, foals, dogs and in and around premises. Sweat and Water resistant formula. Works rain or shine. Will not harm harnesses. CAUTION: For indoor use only. Except when applying to dogs, horses, ponies or foals, do not allow children, adults, or pets to enter until sprays have dried. Do not contaminate food or feedstuff. Direct spray to contact insects for rapid knockdown and kill. Pleasant Citronella scented. Kills and Repels More Than 70 Listed Species Including: Biting Flies, Stable Flies, Horn Flies, House Flies, Face Flies, Horse Flies, Deer Flies, Gnats, No-See-Ums, Carpenter Bees, Fleas, Ticks, Chiggers, Lice and Mosquitoes including Culex species which may transmit West Nile Virus. Cockroaches, Scorpions, Beetles, Centipedes, Millipedes, Fire Ants, Carpenter Ants, Crickets, Spiders, and Black Widows on premises. • REVENGE Equine Fly Spray Ready to Use 32 oz: 32 oz. ORDER NOW! • REVENGE Equine Fly Spray Ready to Use 1 Gallon: 1 Gallon. ORDER NOW! Active Ingredients: Permethrin 0.20%, Pyrethrins 0.10%, N-Octyl bicycloheptene dicarboximide 0.48%. Other Ingredients: 99.22%. Active Ingredients: Cedar Oil 2.00%, Citronella Oil 1.00%, Clove 1.00%. Inert Ingredients*: 96.00% *Inert Ingredients: Corn cobs, Vermiculite and Water. • REVENGE No Escape Mini Fly Reel Kit: REVENGE Sticky Fly Tape No Escape Mini Reel Kit helps lure and catch tens and thousands of flies. REVENGE Sticky Fly Tape is environmentally safe, non-toxic fly control, that you can use everywhere with confidence. For stables, farms, barns, patios and more. Insecticide free. No Escape Mini Reel Kit contains: Fly Tape 81 ft./1 Reel, 1 empty Take-up Reel, and 2 Screws with anchors. ORDER NOW! 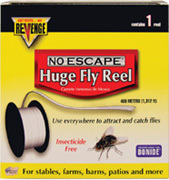 • REVENGE No Escape Huge Fly Reel Tape: Superior non-drying glue Fly Tape. 400 meters (1312 ft). 1 Reel. ORDER NOW! REVENGE Equine Fly Spray 32 oz. aa Equine Fly Spray1 Gal. FLY/PEST CONTROL: REVENGE Equine Fly Spray Ready to Use 32 oz. FLY/PEST CONTROL: REVENGE Fly Beater Fly & Odor Reducer 1.3 lbs. 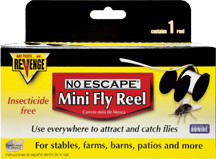 FLY/PEST CONTROL: REVENGE No Escape Huge Fly Reel Tape 1312 ft.
• Prozap Final Fly-T Horse Spray and Wipe-On Insecticide: Final Fly-T has been especially developed for use on horses. It provides a protective hair coating against flies while imparting a high sheen to the hair when brushed out. 1 to 2 ounces per head per day gives adequate protection. Apply by either a soft cloth or fine mist spray. Only a light application is required. Avoid using an excessive amount on your horses. Do not wet skin. After application, brush out thoroughly to bring out bright sheen on the coat. Repeat daily as required. Final Fly-T may be applied as a fine mist spray to stable area and over and around stabled horses for fast paralysis and kill of flies. Do not wet horses’ skin or exceed two ounces per application. Kills and Repels: Horse Flies, Deer Flies, Stable Flies, Horn Flies, House Flies, Face Flies, Mosquitos, and Gnats. Conditions coat and aids in grooming. WARNING: Hazardous to humans amd domestic animals. Keep Out Of Reach Of Children. Harmful if swallowed. 32 oz. ORDER TODAY! Active Ingredients: Pyrethrins 0.1%, Piperonyl Butoxide, technical 1.0%, Butoxypolypropylene Glycol 15.0%. Other Ingredients: 83.9%. • War Paint Insecticidal Paste: The 7% Permethrin paste is applied directly on the animal to control face flies, horn flies, stable flies, house flies, black flies and bot flies on horses and foals. War Paint, when applied to the horse, attaches to the hair of the horse and slowly releases the insecticide over a period of weeks. Full body fly control does not usually occur until 1 to 2 days after the application. The reason for this is it takes awhile for the formulation to release the insecticide onto the horse's hair. Because War Paint is not only an insecticide, but also an effective repellant, you will notice that in the case of face fly activity, the repellant activity of the product will be apparent within hours if not immediately after application. After a period of one to two weeks, as the insecticide is released onto the horse's hair, you will find that War Paint becomes powdery and will fall off the horse's hair leaving no adverse effects on the horse's appearance. 96 gram Tube Treats a 1000 lb. horse For 8 Weeks. One treatment lasts 7 days. Product Is Rain-Fast In 2 Hrs. Full body fly control including face and legs. Easy to apply and odor free. 96 gram tube. ORDER TODAY! Active Ingredients: Permethrin 7.6%, Piperonyl butoxide 14.0%, N-Octyl bicycloheptene Dicarboximide 21.0%. Other Ingredients: 57.4%. • Prozap Insect Guard Strip: Indoor use insecticide effective against flies, mosquitoes, gnats, moths, spiders, cockroaches, silverfish, beetles, earwigs and other pests. The anti-insect technology works 24 hours a day and lasts up to 4 months. ProZap kills flying and crawling insect pests. No assembly is required, hang in an open area and it begins working. Treats approximately 900-1200 cubic feet. Contains dichlorvos and dimethyl phosphate. 2.8 oz. 1 Strip/Pack. ORDER TODAY! FLY/PEST CONTROL: Prozap Final Fly-T Horse Spray, 32 oz. 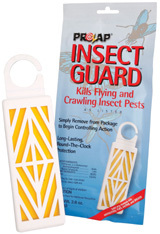 FLY/PEST CONTROL: Prozap Insect Guard Strip, 1 Strip/pk. • Equine Fly & Mosquito 2.5% Concentrate: Controls pests up to 4 weeks! Makes up to 25 gallons of ready-to-use spray. Protects against 6 fly species, mosquitoes, gnats, and more! For use on horses, ponies, dogs and animal premises. Contains: 2.5% Permethrin. 32 oz. 32 oz Concentrate makes up to 25 gallons RTU. ORDER TODAY! Active Ingredients: Permethrin (3-phenoxyphenyl) Methyl (+ or -) cis-trans-3(2,2 dichloroethenyl) 2,2 Dimethylcyclopropanecarboxylate 2.50%. Other Ingredients: 97.50%..
• Equine Fly & Mosquito Ready-To-Use Spray: Controls pests up to 4 weeks! A water-based ready-to-use spray or wipe-on. For use on horses, ponies, dogs, and dog premises. Contains: 2.5% Permethrin. 32 oz. ORDER TODAY! • Pro-Force Fly Bait: Pro-Force Fly Bait is fast acting, ready-to-use house fly bait used for the control of flies in and around areas such as Livestock facilities and Stables. Works against house flies resistant to organophosphates and carbomates. Specially formulated mixture of attractants in a pelleted form. Contains Bitrex bittering agent to help prevent ingestion by animals, children and pets. 1 lb. ORDER TODAY! Active Ingredients: Imidacloprid; 1-[6-Chloro-3-pyridinyl)methyl]-N nitro-2-imidazolidinimine 0.50% Z-9-Tricosene 0.10%. Other Ingredients: 99.40%. • Pro-Force Fly Spray: Pro-Force Fly Spray is an Ready to Use Equine Fly Spray with rapid knockdown, kill and repellency for up to 14 days. Pro-Force Fly Spray helps kill and repel more than 70 listed species. Only for use on ponies, horses, dogs and as a premise spray. Pro-Force Fly Spray helps kill and repel Stable Flies, Horn Flies, House Flies, Face Flies, Horse Flies, Deer Flies, Cluster Flies, Sciarid Flies, Mosquitoes including Culex species which may transmit West Nile Virus, Gnats, Midges, Punkies and No-See-Ums, Carpenter Bees, Moths including Almond, Chocolate, Tobacco, Indian Meal, Angoumois Grain, and other flying moths, Fleas, Ticks including Brown Dog, Lone Star, Deer, Other Ixodid Species, American Dog, and Gulf Coast, Chiggers and Lice. Kills fleas and ticks on dogs. 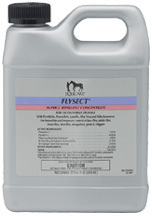 FLY/PEST CONTROL: Equine Fly & Mosquito 2.5% Concentrate, 32 oz. FLY/PEST CONTROL: Equine Fly & Mosquito Ready-To-Use Spray, 32 oz. FLY/PEST CONTROL: PRO Force Fly Bait 1 lb. PRO Force Fly Spray 1 lb. • Wipe N' Spray: Wipe N' Spray is a pyrethrum-based formula that is applied directly on the animal. Ready-to-use Wipe N' Spray offers fly protection and imparts a high shine to the hair when brushed out. A favorite of show horse owners, effective protection results from only 2 ounces per head. Wipe N' Spray is Citronella scented and contains lanolin as a coat conditioner. Kills and repels flies, mosquitoes and gnats. 32 oz. sprayer. ORDER NOW! Active Ingredients: Pyrethrins: 0.10%, Piperonyl Butoxide: 1.00%, Butoxypolypropylene Glycol: 15.00%. Other Ingredients: 83.90%. • Pyranha Insecticide: Pyranha Insecticide is the #1 choice among showmen and trainers across the country for maximum fly control. An equine aerosol that has been on the market for over 15 years. Pyranha Insecticide is a grooming aid and coat conditioner to help kill, repel and conditions. Kills and repels flies, ticks, mosquitoes and gnats. Simply apply and brush out just before entering the show pen for unbeatable fly-fighting power and lustrous eye-catching shine. Use directly on animals and premises. Citronella scented. 15 oz. ORDER NOW! Active Ingredients: Pyrethrins: 0.30%, Piperonyl Butoxide: 2.40%, Butoxypolypropylene Glycol: 33.00%. Other Ingredients: 64.30%. • Equine Spray and Wipe (Water Based):Equine Spray and Wipe is a water-based, advanced horse fly spray that quickly kills and repels flying and biting insects like mosquitoes, flies, gnats and others. With three active ingredients this non-oily insecticide/repellent offers protection for your horse from disease carrying insects, such as Deer Ticks which may carry Lime Disease. Under optimal conditions, Equine Spray and Wipe can be effective for up to 30 days, but we recommend applying every 10 - 14 days to maintain control. It can be applied as a spray or as a wipe. It has a pleasant Citronella scent and won't attract dust like the oil-based products. 32 oz. sprayer. ORDER NOW! Active Ingredients: Permethrin: 0.50%, Pyrethrins: 0.25%, Piperonyl Butoxide: 2.50%. Other Ingredients: 96.75%. • Zero-Bite Natural Insect Spray: Zero-Bite Natural Insect Spray is made with Geraniol, Clove and Peppermint combined to offer nature’s powerful natural fly fighter. The natural oils are suspended in more than 90 percent water, so it is neither oily nor greasy! A safe, non-toxic substitute to traditional fly sprays and wipe. Safe to use on horses, dogs, cats and other small animals too! Great natural scent. 8 oz. ORDER NOW! Active Ingredients: Geraniol 1.00%, Clove Oil: 0.50%, Peppermint Oil: 0.25%, Sodium Lauryl Sulfate: 3.84%. Inert Ingredients: 94.41%. • Nulli-Fly Natural Insect Spray: Nulli-Fly Natural Insect Spray is a water based and long lasting fly spray that doesn't attract dust or grime. Nulli-Fly Natural Insect Spray is a Wipe on or Spray on to help kill and repel stable, horse, face, deer, house and horn flies. Helps deter mosquitoes, gnats and lice. Kills ticks that may carry Lyme disease. Citronella scented. Made in the USA. 32 oz. ORDER NOW! Active Ingredients: Permethrin: 0.15%, Pyrethrins: 0.075%, Piperonyl Butoxide: 0.75%. Other Ingredients: 99.025% . Equine Spray & Wipe, 32 oz. .
FLY/PEST CONTROL: Wipe N' Spray, 32 oz. FLY/PEST CONTROL: Equine Spray and Wipe (Water Based) 32 oz. FLY/PEST CONTROL: Zero-Bite Natural Insect Spray 8 oz. Nulli-Fly Natural Insect Spray 32 oz. Formulated with a unique combination of Citronella, Rosemary Oil, and Cedar Oil that repels flies without irritating horse's skin. The water-based formula is pesticide-free and alcohol-free, so it is safe for open or pre-existing wounds. Coverage lasts 1-2 days. • Natural Horse Spray Concentrate: Dilute Natural Horse Spray Concentrate with 5 parts water to 1 part Natural Horse Concentrate. Apply to coat, legs, shoulders and neck. Pesticide and chemical free. Pleasant herbal fragrance. Easy to use. No mixing required. 32 oz. ORDER TODAY! Active Ingredients: Sodium Lauryl Sulfate (8.0%), Rosemary Oil (0.42%), Cedar Oil (0.42%) and Citronella Oil (0.42%). Inert Ingredients: Deionized Water and Glycerine (Total Inerts: 90.74%). • Natural Horse Spray Ready-to-Use: Pesticide and chemical free. Pleasant herbal fragrance. Easy to use. No mixing required. For best results, hold spray bottle approximately 10-12 inches away from animal. Apply to coat, legs, shoulders and neck. 32 oz. Sprayer. ORDER TODAY! FLY/PEST CONTROL: Natural Horse Spray Concentrate, 32 oz. FLY/PEST CONTROL: Natural Horse Spray Ready-To-Use, 32 oz. • Aloe Herbal Horse Spray 5 to 1 Concentrate: A gentle, effective, pesticide free spray with coat conditioners and sunscreen formulated to aid in the control of insect related skin problems. Safe for use in barn and stall areas. Available in Concentrate (5:1 diution) or Ready to Use formulas. Contains Cedarwood Oil, Citronella Oil, Eucalyptus Oil. (Horse Journal Product of the Year). Concentrated Formula 1 to 5 (1 part Horse Spray to 5 parts water). 32 oz. ORDER TODAY! Active Ingredients: Citronella Oil 0.750%, Cedarwood Oil 0.500%, Eucalyptus Oil 0.378%. Other Ingredients: 98.372%. • Aloe Herbal Horse Spray Ready To Use Sprayer: A gentle, effective, pesticide free spray with coat conditioners and sunscreen formulated to aid in the control of insect related skin problems. Safe for use in barn and stall areas. Available in Concentrate (5:1 diution) or Ready to Use formulas. Contains Cedarwood Oil, Citronella Oil, Eucalyptus Oil. Ready to Use Formula. (Horse Journal Top Natural Fly Spray) 32 oz. Sprayer. ORDER TODAY! Active Ingredients: Citronella Oil 0.1500%, Cedarwood Oil 0.1000%, Eucalyptus Oil 0.9756%. Other Ingredients* 99.6744%. * Aloe Vera, Mineral Oil, Purified Water, Sunscreen, Conditioner. • Repellent Wipes Fly & Mosquito: Fly & Mosquito Repellent Wipes help protect your pet from irritating flies and mosquitos with a gentle blend of natural botanical oils. Fly & Mosquito Repellent Wipes helps deter flies and mosquitos from contact and stops biting and irritation. Fly & Mosquito Wipes contain natural repellents and coat conditioners to encourage an insect free healthy coat. Herbal scent. 50 Wipes/Canister. ORDER TODAY! Active Ingredients: Citronella Oil 3.0%, Peppermint Oil 2.0%, Cedar Oil 2.0%. Inert Ingredients: Purified Water, Mineral Oil, Potassium Sodium, Xanthan Gum, Sodium Lauryl Sulfate..
• Repellent Wipes Flea & Tick: Fly & Mosquito Repellent Wipes help protect your pet from irritating flies and mosquitos with a gentle blend of natural botanical oils. Fly & Mosquito Repellent Wipes helps deter flies and mosquitos from contact and stops biting and irritation. Fly & Mosquito Wipes contain natural repellents and coat conditioners to encourage an insect free healthy coat. Herbal scent. 50 Wipes/Canister. ORDER TODAY! Active Ingredients: Citronella Oil, Peppermint Oil, Rosemary Oil, Cedar Oil, And Mint Oil. Inactive Ingredients: Vitamin E, Isopropyl Alcohol, and Purified Water. FLY/PEST CONTROL: Repellent Wipes 50 Ct.
• Natural Flea & Tick Repellent: Natural Flea & Tick Repellent is a water based formula using an exclusive blend of Citronella and other Botanicals, without the use of harsh chemicals or pesticides. Gentle enough for daily use and will not burn sensitive skin. Natural Flea & Tick Repellent helps deter fleas, ticks, and biting insects, including mosquitoes, yellow flies, black flies, no-see-ums, gnats, chiggers, and deer flies. No preservatives, no artificial colors, no additives, not oily or greasy. Pleasant herbal fragrance, gentle, non-oily spray or wipe on for pets. Formulated dog, cats, and horses. Made in the USA. 16 oz. ORDER TODAY! Active Ingredients: 3.60%: Citronella Oil 0.60%, Peppermint Oil 0.50%, Lemongrass Oil 0.50%, Cedar Oil 0.37%, Rosemary Oil 0.08%, Clove Oil 0.05%, Sodium Lauryl Sulfate 1.50%. *Inert Ingredients 96.40%. *Water, Xanthan Gum. FLY/PEST CONTROL: Natural Flea & Tick Repellent 16 oz. • Equine Fly Repellent: Equine Fly Repellent is made with Pyrethrins or essential oils, natural food-grade fatty acids and silicone oil. Sprayer is designed to offer an easy-to-hold application system that allows for a more pleasant spraying experience. Equine Fly Repellent creates a "zone" of repellency that stops the pests from landing on the horse. Equine Fly Repellent is blended with fragrance that includes Sage and Lavender. 18 oz. ORDER TODAY! Ingredients: Octanoic Acid: 5.0% Nonanoic Acid: 5.0% Decanoic Acid: 5.0%. Other ingredients: 85.0%..
FLY/PEST CONTROL: Equine Fly Repellent 18 oz. • No Fly Zone Horse Spray: No Fly Zone Horse Spray is an all-natural fly spray. Safe, non-toxic and environmentally friendly formula. Uses the unique powers of oil extract from clove, citronella and lemon grass. Gentle, yet effective water based pesticide-free spray. Effectively repels flies, mosquitoes and gnats. Non-irritating, natural, botanical formula can be used as needed. Offers a gentle, non-irritating solution for your horse. Can be used as needed on your horse or in stable areas. 32 oz. sprayer. ORDER TODAY! • Barn Barrier Natural Fly Repellent: Barn Barrier Natural Fly Repellent is made of 4 natural botanical oils and proven to repel Horn Flies, Face Flies, Stable Flies, and House Flies. Barn Barrier is also pH balanced, unlike other Fly Sprays, so it won’t irritate your horse’s skin or damage coats, manes, or tails. Safe for use on bedding, bridles, blankets & other tack. Safe for horses, ponies, and foals. Safe and effective, environmentally friendly, and CITRONELLA FREE. Clean fresh scent. 32 oz. sprayer. ORDER TODAY! Ingredients: Lemon Grass Oil, Cedar Oil, Peppermint Oil, Geranium Oil, Water Soap, Citric Acid, Sodium Benzoate, Potassium Sorbate. FLY/PEST CONTROL: No Fly Zone Horse Spray, 32 oz. FLY/PEST CONTROL: Barn Barrier Natural Fly Repellent, 32 oz. • Pete's Botanical Horse Spray: Pete's Botanical Horse Spray helps minimize the nuisance caused by the presence of flies on and near animals. Pete's Horse Spray is made with botanical oils like Citronella oil, Pennyroyal oil, Cedarwood oil and Aloe Vera. These ingredients are blended to give your animal a fresh feel and promote nuisance-free surroundings. Pete's Horse Spray provides a pleasant herbal scent of Botanical oils on the animals and thereby reducing irritation and problems caused by excessive fly infestation. 32 oz. ORDER TODAY! Ingredients: Deionized Water, Oil of Citronella, Oil of Cedarwood, Oil of Rosemary, Oil of Soybean, and Conditioners. • Safer Flying Insect Killer: Safer Flying Insect Killer helps kill flying insects on contact. Safer Flying Insect Killer is made with Pyrethrin and Potassium Salts of Fatty Acids (insecticidal soap), offers you with the contact killer you have been looking for, but in a formula that's in compliance for organic use! Safer Flying Insect Killer has a fresh Citrus fragrance with no lingering chemical odor. 14 oz. Aerosol Can. ORDER TODAY! Active Ingredients: by wt. D-Limonene 1.000% , Pyrethrins 0.050%, Potassium Salts of Fatty Acids 1.000%. Other Ingredients: 97.950%. FLY/PEST CONTROL: Pete's Botanical Horse Spray 32 oz. FLY/PEST CONTROL: Safer Flying Insect Killer 14 oz.